Ali Baba and the 40 Thieves by Leander Games is a 5 reels and 40 payline slot. The slot includes a Gold or Bandit pick me bonus feature, expanding wilds, Open Sesame Free Spins Bonus feature with up to 25 spins on offer, multipliers and more. All that there's left to say is ‘open sesame’ and start your stakes from 20p to £20 per spin. Check out more casino games at Slots Baby. Leander Games was established in 2008. Leander online slots feature several innovative themes. The company is headquartered in Argentina. Leander Games has business partnerships with quite a few major casino and development teams. Leander slots don't require any download as they use both downloadable options and browser technology. Ali Baba and the 40 Thieves has beautiful visuals. The reels are set against a desert sort of in the middle of an oasis. Symbols on the reels include rings, monkeys musical instruments, snakes, swords, camels scarab and beetles, a mean thief and Ali Baba himself. Ali Baba pays the highest value of 2,500 coins. * Gold or Bandit Bonus feature -This feature is activated when 3 bonus symbols land on the 2nd, 3rd and 4th reels. It is essentially a pick me round with a dash of extra wrinkles. Once it is active, a new screen fills with vases. Spinners are meant to find hidden treasures and given 6 picks. Before the feature begins, 3 Ali Protections will be awarded. Pick a monkey in 1 of the vases on the screen and you will get a life. Pick a monkey when protections run out and the feature will end. -Low risk – offers up to 4 picks, 15 free spins and a 4x multiplier. -Medium risk- offers up to 6 picks, 20 free spins, and a 5x multiplier. -High risk- offers of up to 8 picks, 25 free spins and a 6x multiplier. When the feature starts, a room full of treasure chests will appear on the screen. Pick 6 chests and locate numbers below the spins and multiplier options you hoped for. If you go over the total, you’ll win 10 free spins plus a 1x multiplier. A stacked wild appears on the 1st reel during all the free spins. Wins are boosted by the multiplier value you finished with. Head to S-Baby for more slots from this developer. The Ali Baba and the 40 Thieves slot has some nicely done visuals. This Leander Gaming slot has a lovely mix of bonuses and quality visuals. An extra perk for slot players is that they can choose the level of variance they're most comfortable. If you get lucky with free spins and the stacked wilds, 40 thieves can help you pile up on that coin. 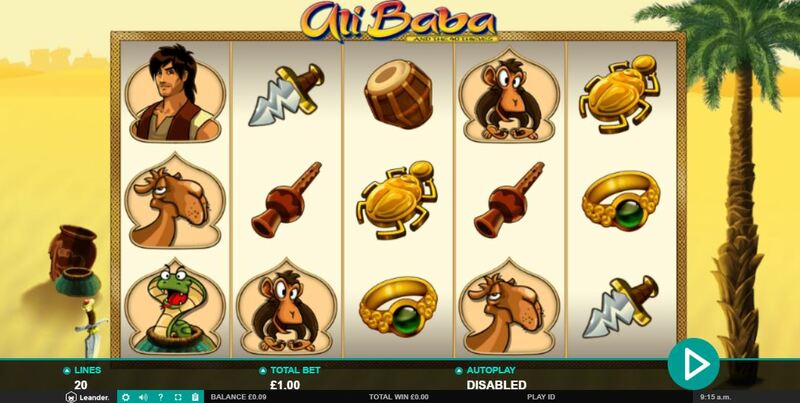 If you enjoyed Ali Baba, then check out more real slot games online.